Living life by seeing the Brighter side isn’t easy. To the average person, we can make it a choice. But not everyone can make that choice. I’m talking about Mental Illness. Not long ago there was a Mental Illness campaign that tried to get the word out about who Mental Illness affects. It was a commercial that showed a drawing board with a pointer. On the drawing board was a picture of Earth. The message was, Mental Illness can affect anyone, but you can’t always see it. It’s not a condition you can see. It’s not a condition you can put a cast on to fix. It’s not a condition you choose to be in either. Just talk to Lee Horbachewski. She’s a suicide survivor, who lives with depression. And now Lee is taking a stand to help reduce the stigma and build awareness for Mental Illness and Suicide Prevention. 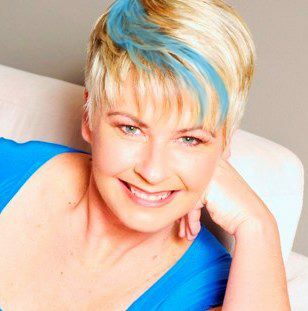 Her Going Blue 4 U campaign is passionate about raising $40,000 to be donated to local charitable organizations that provide resources and support for Mental Illness. In Calgary, the funds will support the Distress Centre. The entire team will all dye their hair blue if they reach their goal. There are 10 days left for the Going Blue 4 U awareness campaign putting a colorful spin on “The Blues”. Mental Illness impacts nearly 6 million Canadians, which is 20% of our population. Suicide accounts for 24% of all deaths among Canadians aged 15-24 and 16% of all deaths for the age group 25-44. Lee Horbachewski has a vision: “To Empower You to Shine Bright & Steady, to be Aware, Accept and take Action by living life authentically and realizing you are never alone.” Truth that you CAN live on The Brighter Side. It’s not always easy, and you may need a helping hand along the way!